“You can’t help getting older, but you don’t have to get old,” said George Burns. There’s no more apt description of one legendary skier, Bob McLennan, better known as simply McDuff. McLennan started skiing in the Laurentians more than 63 years ago and is still a common sight around Tremblant today. Having worked countless jobs in the ski industry (including magazine publishing), he taught skiing for 61 of those years at numerous Quebec hills, including Gray Rocks, Belle-Neige and Mont Tremblant alongside well-respected ski school director Ernie McCulloch. His hilarious and sometimes far-fetched stories make any cold ride on the lifts better. Born in Newfoundland before moving to Montreal, McLennan recalls his mother sewing underpants out of flour sacks, for instance. 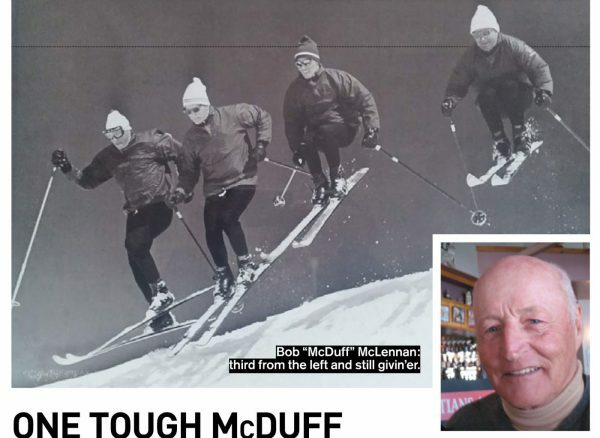 He also travelled the world to more than 100 ski resorts, including five seasons in Australia, earning his Level IV in both instructing and coaching as well as his nickname McDuff—because “there were just too many Bobs.” In his busiest years he racked up as many as 330 days on snow, chasing winter all over the globe. Age is just a number and McLennan prefers measuring time by sharing stats. From 2017-18: 98 kph downhill speed; 354,000 m of vertical; and 2,270 km distance over 145 days. Not bad for a guy born in the late ’30s! He still hears people say they hope to ski like him when they’re older; they’d better try to ski like him now. “You have to get to my age first,” he says with a devilish grin. McLennan understands it’s a privilege to wake up and be able to ski every day the lifts open. As he flies down black diamonds today, people admire his smooth turns perfected over many years as a CSIA course conductor and member of the Interski Demo Team. “I love skiing fast. It makes me feel like I’m accomplishing something.” What if he fell? “That’s the cost of doing business, I guess,” says McLennan. “Knees are good, but the hip is sore,” he reports. His surgeon was going to replace it last spring, but with the possibility of never skiing again after, it wasn’t surprising McLennan delayed the procedure indefinitely. A typical day includes rounds of 100 push-ups, arriving at the hill by 9:00 a.m., then riding the gondola to put in a few runs. He gave up smoking three packs a day, drinking and ex-wives years ago. “But I still very much enjoy the social aspect of après ski at the lodge before heading home,” says McDuff.